160 Acres Johnson County IL Breathtaking scenery, managed timber, clover fields, trails, bluffs, caves, waterfalls, creeks and MORE! Recreational property for sale! WOW! Breathtaking scenery! This property is like owning your own state park! You can’t imagine the size of the rock shelves (large enough to park half a dozen Greyhound Buses under) and to walk up on them after a rain with the waterfall dropping 70 feet to the pool in the canyon floor is like a scene from a travel brochure. And imagine an Indian tribe at one time calling this home, plenty of shelter, water and abundant game. It is a peaceful place to escape from the world and an excellent setting for a new home. There are 160 acres of managed timber, clover fields, trails, bluffs (nearly a mile of bluff line), caves, waterfalls and creeks with big deer, lots of turkey and other wildlife. The property is surveyed and has a current forest management plan and wildlife management plan. 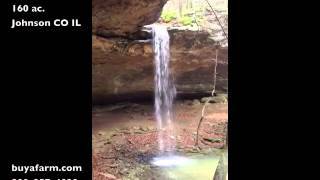 It lays near the Shawnee National Forest, one mile upstream from Dutchman Lake. The property is currently enrolled in a USDA Conservation Program paying $2,301 annually. This is a very scenic and nicely secluded property with public water and electric available. The farm is located 2 miles south and 2 miles east of Ferne Clyffe State Park near Goreville. The farm is in the Goreville School District. REAL ESTATE TAXES: $43.18 (2014 paid 2015) (Tax ID #02-31-302-000 and 01-36-202-001).